U.S. Mail Fraud in Health Care Fraud Cases - Oberheiden, P.C. How many types of fraud can you think of? There’s bank fraud, insurance fraud, consumer fraud, wire fraud, identity theft, payroll fraud… and the list goes on. But it might surprise you to learn how often these multiple types of fraud are charged together in the same case, arising out of the same set of facts. A business executive, for example, might be indicted on charges of bank, consumer, wire, and payroll fraud all at once. That’s especially common in the type of fraud our law firm handles most often: health care fraud. This article is the latest in a series exploring the most common federal criminal statutes used against doctors, pharmacists, health care executives, and other white-collar professionals in the medical field. One of those statutes — and the focus of today’s article — is Title 18, Section 1341 of the U.S. Code (18 USC 1341): the federal mail fraud statute. You might think of health care fraud and mail fraud as two entirely different kinds of fraud. But prosecutors try to use 18 USC 1341 in health care criminal cases whenever they can — and there are specific tactical reasons for that. We’ll explore those reasons, and the core of the statute itself, below. We want health care providers to know how easily everyday conduct can be misconstrued as mail fraud, and how eager federal agents are to pursue this convenient add-on charge. What Does 18 USC 1341 Actually Say? 18 USC 1341 is actually titled “Frauds and Swindles.” It is the first section of Chapter 63, which is entitled “Mail Fraud and Other Fraud Offenses.” Those titles can lead to some confusion as to which statute people mean when they talk about “mail fraud.” While any of the provisions in Chapter 63 could be relevant in a mail fraud case (depending on the circumstances), it is Section 1341 that most immediately pertains to the crime of mail fraud. This statute can be difficult for people to read. As you can see, the first sentence alone contains over 200 words. We’ve linked to a couple of key statutory definitions for you above, and also highlighted some of the most important words. But to help you better break down the conduct and mental state contemplated within 18 USC 1341, let’s outline its most important provisions in the sections that follow. 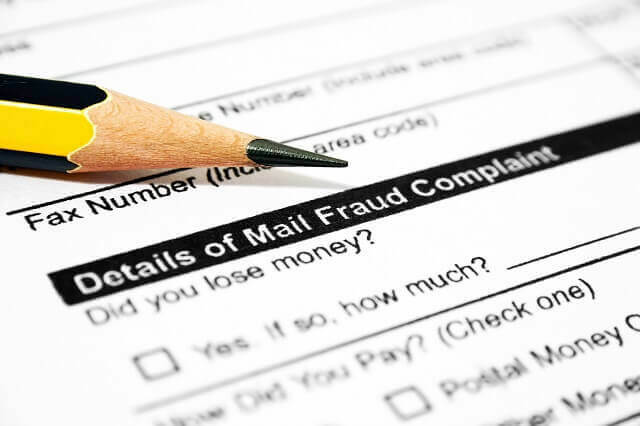 What Kind of “Mail” Counts as Mail Fraud? Electronic mail and transmissions (e.g., email, fax, phone) are usually prosecuted as wire fraud under 18 USC 1343 instead, though prosecutors frequently charge both statutes simultaneously. The statute can apply if these services play virtually any role — even a very small one — in the alleged commission of fraud. Notably, it’s not only the sender who can be prosecuted under 18 USC 1341 but also the recipient. Why Do Prosecutors Try to Use 18 USC 1347 in Health Care Fraud Cases? Part of a prosecutor’s job (in their view, anyway) is to get the highest number of convictions and harshest sentences possible. Unfortunately, this is how prosecutors build their careers. So part of the reason for charging 18 USC 1347 in addition to health care fraud or a conspiracy count is simply that it’s an easy charge to add. For instance, simply mailing a fraudulent invoice to CMS can be enough to constitute both health care fraud and mail fraud (or wire fraud if the invoice is submitted electronically). But there is another advantage to prosecutors in 18 USC 1341: they can also seek injunctive relief under the authority of § 1345 (found within the same Mail Fraud Chapter). In fact, 1345 specifically mentions “federal health care offenses” in Part (a)(1)(C). What this means is that, by alleging mail fraud, the government can ask a court to freeze the defendant’s assets in order to prevent any further fraud. These charges can also have the effect of freezing or delaying payments from CMS for legitimate services your practice has provided. If you are under investigation for making fraudulent representations or submissions to the government or a private insurer, the medical mail fraud defense lawyers at Oberheiden, P.C. can help. Contact us online or call (888) 727-0472 right away. Primary Office in Dallas, TX. Dallas Mail Fraud Defense for Physicians. 18 USC 1343: Federal Wire Fraud as a Health Care Crime What Is Conspiracy to Commit Bribery (18 U.S.C. 201; 18 U.S.C. 371)?